We are excited to announce that we have some new additions to the Kisaiya Team who will be working as Brand Ambassadors. Meet Hannah & Georgie! Hannah is the UKUP Current Pro Female Champion and has transformed her body in a relatively short time, winning 3 different competitions in the UK. She is also a personal trainer so know what it takes to maintain a healthy lifestyle. As an ambassador, she is ideal for our brand as she knows both ends of the fitness spectrum, as at one end she competes at a very high level for her competitions whilst also being into health and nutrition. Hannah also has a keen interest in yoga as she finds it a great way to relax and stretch out her muscles. Georgie a TV Producer, is currently in LA embracing the wonderful fitness opportunities that the city has to offer – from hikes up Runyon Canyon to bike rides on Venice beach. 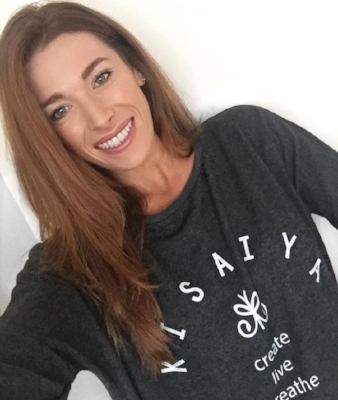 She is visiting fitness hot spots and yoga studios across the city to spread the word about Kisaiya. She loves practicing yoga and enjoys working up a sweat in a Vinyasa Flow class. She is also a keen runner and ran the London Marathon in 2012. We have teamed up with Yogi Yoga in Wandsworth, London - a fab new Yoga & Pilates studio founded by Erika Shapiro. Why don't you try out a new class and whilst you're there check out some of our product! Yogiyoga stems from real passion and a sense of a true calling. The wish is that this yoga space will offer a sanctuary of peace to the local community and that it will be a space, that relieves clients of the stress and pressures of daily life, at the same time creating and cementing more community, a place where people can meet and connect through the beautiful practice that is yoga. Due to our special show promotions and sample sale at the recent Om Yoga Show we sold a lot of clothing, therefore some of our stocks are now very low! Please bear with us whilst we replenish stock and keep following for new styles and colours which will be on our website soon. If you have a special show discount, this can be used until 28th November. Have a read of our latest blog post to see how we got on! We hope you like our products as much as we do. It's always great to hear feedback so we know what we are doing well or maybe not so well so we can continue to grow as a brand and give you, our customers exactly what you need. From seamless tops designed for a flowing yoga practice to leggings that can be worn in and out of the studio. If you have any suggestions or feedback we would love to hear from you - please email us on the 'CONTACT' page. Alternatively if you would like to join our mailing list for the latest offers please sign up in the section below.